Erin McConahey, mechanical engineer and a principal with Arup’s LA office. Jeff Vaglio, facade engineer and director of Enclos’ Advanced Technology Studio. 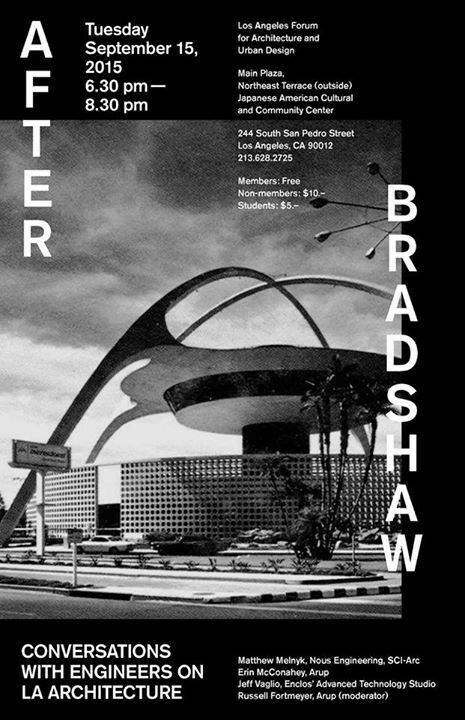 Russell Fortmeyer, the LA Forum’s treasurer and the sustainability leader for Arup’s LA office, will moderate the conversation; and will briefly discuss Bradshaw’s work. The event will be at the Japanese American Cultural and Community Center’s northeast terrace, just off the main plaza, in order to afford views of the exterior of the concrete building. The Center located in LA’s Little Tokyo neighborhood downtown, is featured in the newsletter; the Center opened in 1983 and was designed by Kazumi Adachi, Kiyoshi Sawano, and Hideo Matsunaga. The event is supported by ARUP Los Angeles. Cover image designed by River Jukes-Hudson and Dante Carlos.